See, it's not really because she's actually insanely hot. You just have to understand she's really hot for a Jew. I mean we're not typically a very attractive people. More often than not we praise med student loans and respecting one's mother above the ability to dance or, say, not use one's wallet as a booster seat for our offspring. 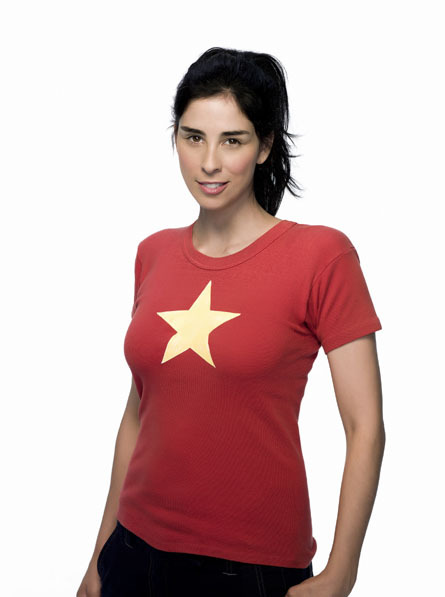 So yes, we know Ms. Silverman is no Megan Fox, though I'm sure she also enjoys giant robots performing bathroom humor. However Sarah's nose won't quite double as a glass cutter and her hair doesn't threaten to choke her in her sleep, so, please, just give us this one. We promise not to tell the Egyptians. Or Jimmy Kimmel.